Long before I even knew about urban sketching, while I was still in Ottawa, I found out about the Toronto Subway Sketchgroup. It's a group of artists who meet every Sunday in the subway to sketch people. I thought it was an awesome idea and kept it in mind in case I would get a chance to go. Now that I'm in Toronto, I'm looking forward to get some time to meet up, but in the mean time I practice whenever I get a chance. 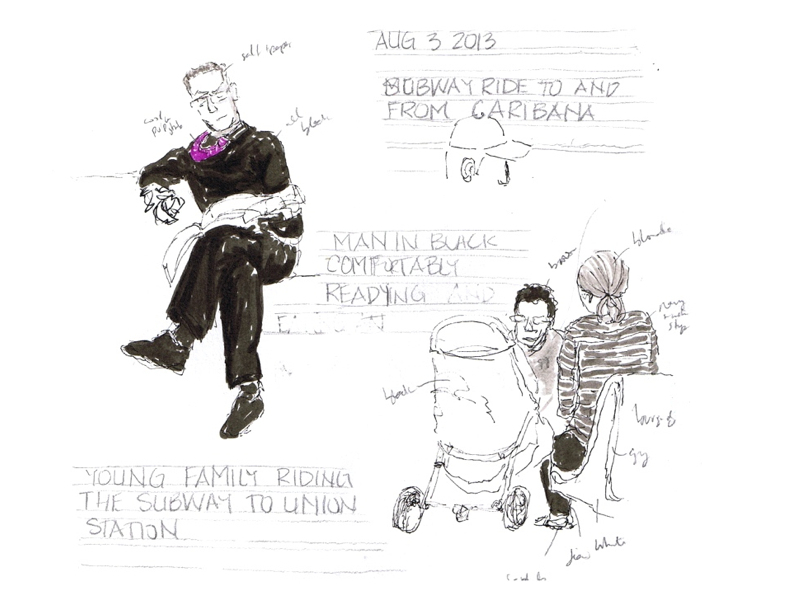 On my way back from Caribana I took the time to do a couple sketches of people in the subway. I always try to draw people who look like they will be still long enough for me to draw them. It's an interesting guessing game as well as a study into human behaviour. The man sitting on the left was reading while eating an apple. I thought it was cool that he had a purple tie to add some colour to his black ensemble. On the lower right there was a couple sitting and paying attention to their baby.